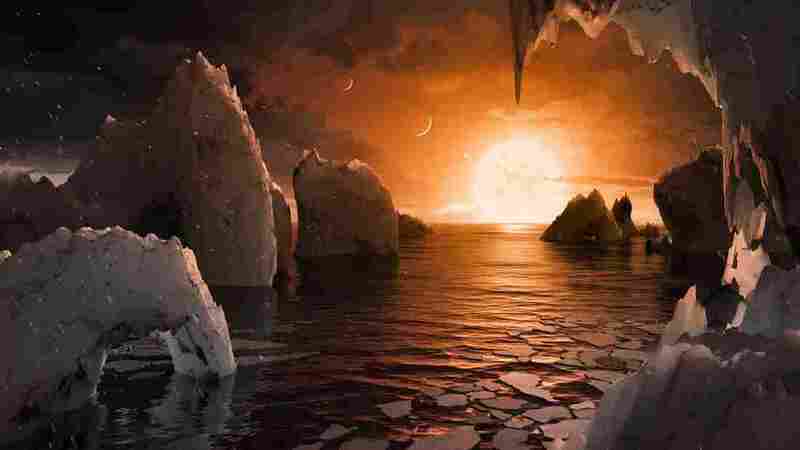 This artist’s rendering shows what one of the seven planets, TRAPPIST-1f, might look like. A small, faint star relatively close by is home to seven Earth-size planets with conditions that could be right for liquid water and maybe even life. The discovery sets a record for both the most Earth-size planets and the most potentially habitable planets ever discovered around a single star. The strange planetary system is quite compact, with all of these worlds orbiting their star closer than Mercury orbits the sun, according to a newly published report in Nature. Until recently, no one was even looking for planets around so-called ultracool dwarf stars. About a year ago, however, scientists announced that they’d found three planets around this star. They launched a campaign to study the star more intensively, and were surprised to find four more. All of the planets were spotted by looking for a faint dimming that occurs when starlight is blocked by a planet passing in front of the star. Julien de Wit of MIT, one of the astronomers on the research team, says these planets have a “winning combination” of being temperate, Earth-size and ideally suited for follow-up observations with telescopes to analyze their atmospheres. Already, initial observations have been made with the Hubble Space Telescope, he says, and the data is being analyzed. More observations with Hubble are planned to search for signs of water or methane. Astronomers could get an even better sense after 2018, when the next-generation James Webb Space Telescope is expected to launch. It could provide an in-depth look at the atmospheres of these planets. This artist’s rendering depicts the TRAPPIST-1 planetary system, based on available data about their diameters, masses and distances from the host star. The cool, reddish star is about 40 light-years away from Earth. Planet-hunters have recently been gathering more and more evidence that Earth-size planets are common in our galaxy, according to Ignas Snellen at the University of Leiden in the Netherlands, who wrote a commentary that accompanied the scientists’ announcement.